This is my version of chicken and rice. Super easy and quick. It’s a one pot meal. I do the whole thing in my 5-1/2 QT Dutch oven that has a heavy top. Fry chicken in some oil just to brown on the outside. Make sure you brown it well. Salt & pepper to taste. Remove chicken and fry onion slices, red pepper strips, garlic, cumin, paprika, cilantro, peas, corn, tomatoes and add broth. Reduce heat, cover and simmer on top of stove for 20 mins. Add rice and salt. Add chicken back in the pot. Cover and place in a 350 oven for 35 minutes. 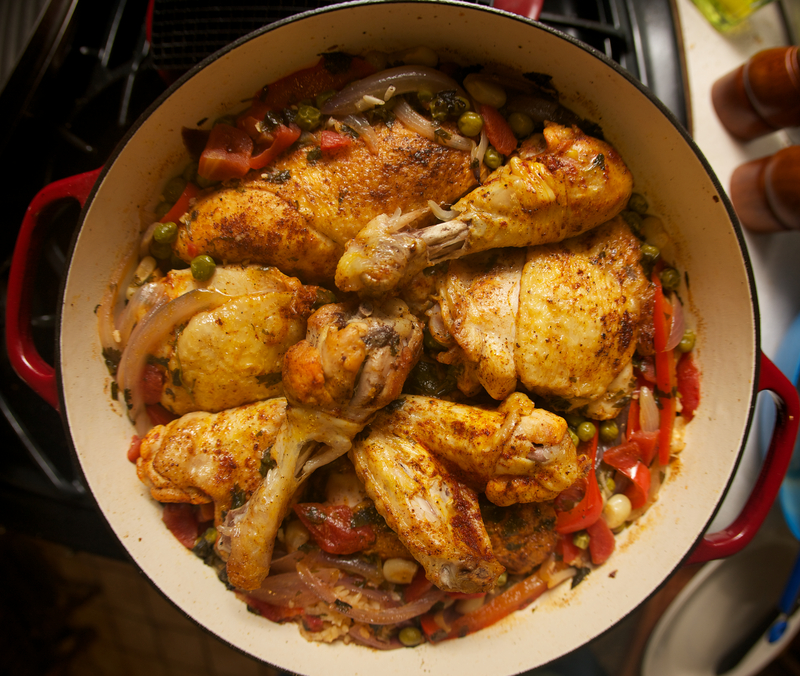 This entry was posted in Uncategorized and tagged arroz con pollo, chicken, chicken and rice. Bookmark the permalink. Sounds yummy and simple! Will have to give a try soon! That looks so good. Is it on the spicy side? Ingrid if you want to make it spicy you can but this isn’t.